The charity team are most encouraging, I definitely would recommend the experience. I also met up with two others doing it for Rainbow Trust Children’s Charity, who braved T-shirts at base camp – in very cold conditions! Andy Norris from Kent, embarked on a journey to climb Africa’s highest peak, Mount Kilimanjaro for Rainbow Trust in January 2015. 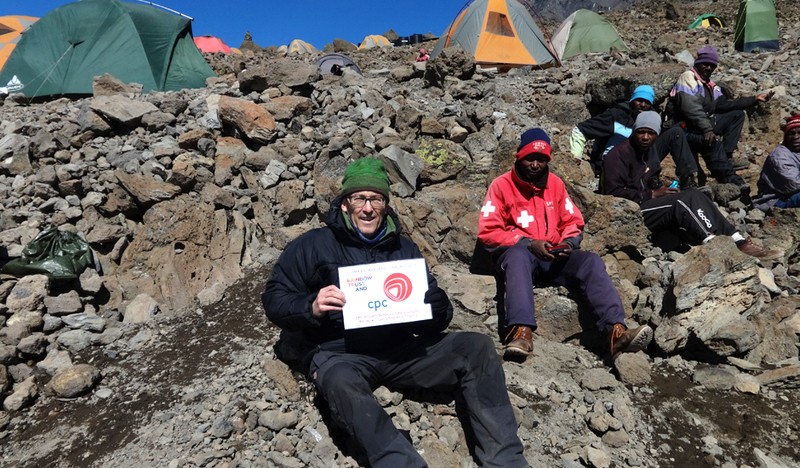 Rainbow Trust had been supported by his company, CPC, for two years and it was this that inspired Andy to get involved and take on a challenge in a bid to raise even more funds. Here, Andy shares how he got on and his top tips to anyone considering following in his footsteps. How did you prepare for such a huge challenge? I got a personal trainer and we met every 2 weeks for a year prior to the challenge. I also did a number of long mountain walks in the Lake District and north Wales. How did it feel during the challenge itself? The flight out and back was exceptionally long with little sleep. Days 1-2 of the climb went well and I had no problems adjusting to walking all day and drinking 3 litres a day. Days 3 and 4 up to base camp were very difficult as I started to get altitude sickness and the weather started to become more harsh with sleet, rain, fog, etc. We typically walked 8 hours a day in 1 hour sessions with 10 minute breathers. The altitude sickness impacted my food intake which eventually reduced to nothing. Consequently 2 hours before the summit climb at 21:00 I opted to pull out – knowing I had insufficient gas in the tank to get up. I rested in my tent whilst the others in my team succeeded in reaching the top and getting above the clouds. Day 5 and 6 we descended down the mountain to a big meal in the hot Tanzanian sun. The views were absolutely amazing and every experience was to the extreme in so many ways. The team bonded so well and got close during the trip like one large family. The local porters, cooks and guides were amazing, we had 43 in total! – and all went beyond the call of duty to help us in such a challenging environment. Top thing to take next time – warmer thermal underwear! Don’t take so many sweets. Our food was ample. You get 3 hot meals a day – so should never feel hungry. Top training tip – squats and lunges; core muscles, particularly the legs, need to be in their best shape to survive Kili! Fundraising – Plan your fundraising, start early and find a few big sponsors to get off to a flying start! I was honest enough to say it was about charity but also my own personal objective of climbing Kili. If you are inspired to take on a challenge, our dedicated Events team will support you every step of the way, just get in touch to let us know what you are planning to do.